BUILD is an immersive installation by Artist Lisa Traxler housed in the Surface Matter materials studio in London Fields. Materials meet art, informed by architecture in a visual narrative heavy with the echo of history. BUILD is a series of sculptures, shapes and works incorporating unusual materials like vitreous enamelled steel, stitched paper, vinyl and recycled paper composite. 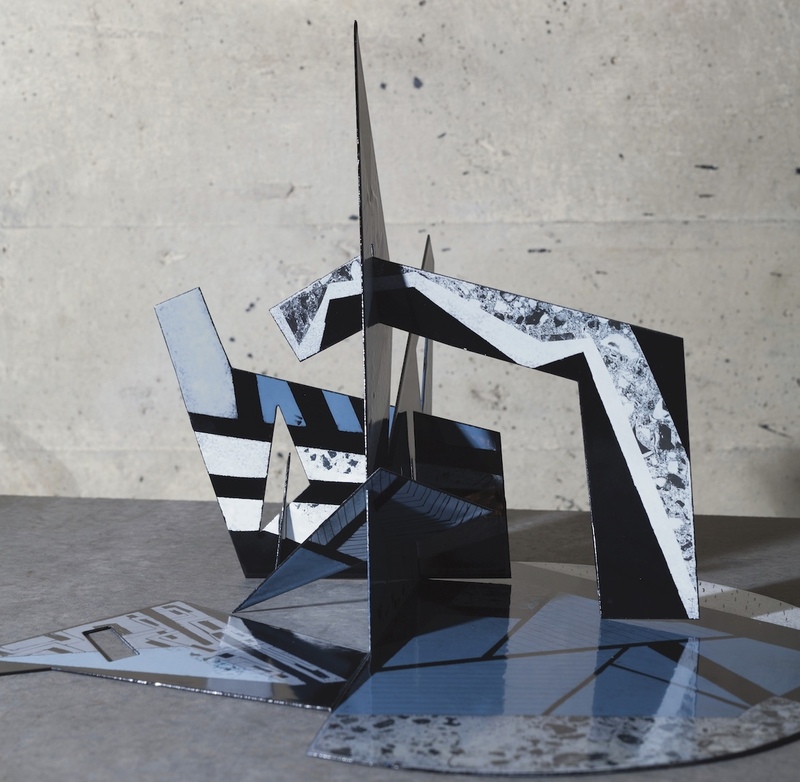 Inspired by dazzle camouflage and radar, Traxler's work is a reaction to the restoration/conversion of a WWII Radar Bunker on the Isle of Wight. Meet the artist, see the bunker in film, learn about materials and play with the notions of encrypted communication. BUILD is part of the Maker Mile Design Route for London Design Festival. In BUILD, Lisa Traxler creates an environmental autobiography – a sense of self and place intimately connected. Eight vitreous enamel and steel constructions look to have been lifted from the blueprint of a technical drawing documenting a secret architectural design. Lightly interlocking and carefully constructed, these fragmented shards slot together, creating interference and misleading the eye and causing a sense of unease. Alongside the sculptures, Lisa's printed and stitched PAPERSCAPES are swooping and soaring as if in flight above applied vinyl graphics of shattered shapes. A film by Julian Winslow shows the converted WWII Bunker on the Isle of Wight with paper composite fins facade, suspended staircase, aluminium foamed fire surround, brutalist architecture and more enamelled steel. The Bunker was designed by the artist's partner, award-winning Lincoln Miles Architecture, who also designed our materials studio. The exhibition is open to the public throughout London Design Festival, and part of the Maker Mile Design Route. On Monday 18 September we're hosting a private view with the artist with serving canapes from Howard's Meat Co, beers from The Five Points Brewing Co and giving away a limited edition DAZZLE tote bag.